Choosing the perfect game camera for your trailing activity is no joke. You need to make your purchase purposeful, so you can have the perfect device to make your hunting activity more memorable and enjoyable. There are many things you should consider before buying a trail camera. In this case, this Stealth Cam G42 No-Glow Trail Game Camera Review can help you determine if the Stealth Cam G42 No-Glow Trail Game Camera is the trail camera you need. Continue reading this article to be equipped with more knowledge. Stealth Cam G42 No-Glow Trail Game Camera is perfect for a trail camera. This is highly dependable and of high-quality. The features can be enjoyed for a reasonable price. This game camera is perfect to use whether at day or night. This is meant for most elusive species including deer, foxes, and even red squirrels. This infrared trail camera is necessary for it would also act as a mobile digital camera. What makes it different though is that it has this motion detection system. This way, you can detect intruders be it humans or animals. This would trigger the camera to take a series of footage or images if there is a need for such. Here are some of the common features of the Stealth Cam G42 No-Glo Trail Game Camera. It is perfect for security purposes, it does not produce and create noise, and it works perfectly even in a dark room. The slight red glow is barely visible. This is ideal for first-time buyers because of its simplicity. If you buy a set, this includes the strap, batteries, and SD card. You may set up this game camera in TL mode with delays if necessary. You can adjust it later on as needed. Like other products, this game camera has its advantages and disadvantages. Let us review the pros first. This Stealth Cam G42 No-Glow Trail Game Camera can be set up on feeding stations since it has a reliable battery life. The quality of the image is good for both day and night. It comes with a really bright infrared while the flashes do not have a glow. It functions well with a night IR and a decent detection range. This game camera also works perfectly when used in hybrid mode. This trail device is Ideal as a surveillance camera for your whole property. It takes great pictures and is compatible with lithium or alkaline batteries. This is perfect if you are looking for a farm security camera. The manual is detailed enough to be understood properly. You would be glad to know that it features 10 megapixels, an HD Video, and a 100-foot range. It is easy to set up so new users will be able to understand it with ease. This camera works great even in bad weathers. As with its cons, this game camera may not work accordingly if your battery is not reliable, most especially at night. Microcards are also not very much supported by this camera. Every gadget comes with its highlights and downsides. Prior to buying, all of these should be realized first. It would really help for them to be understood so that you would not have a hard time using it later on. 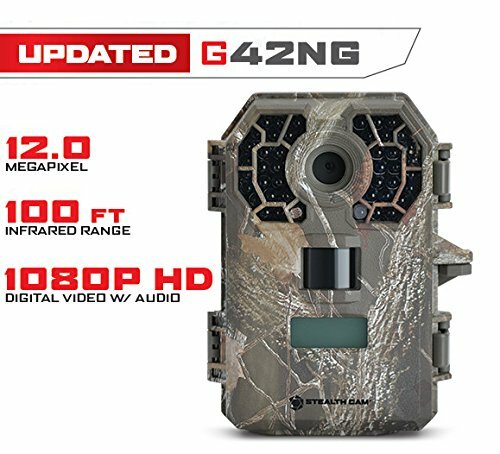 Stealth Cam G42 No-Glo Trail Game Camera is meant for hunting. This is a chance for hunters to scout whatever patterns there may be that is perfect for hunting. This scouting camera can show how capturing footage is applicable. This is meant primarily for elusive animals including badgers and river otters. You can use this game camera to patrol your garden even at night. It comes with a flash but provides powerful shots. You can always adjust the flash accordingly.